In John Yungblut: Passing the Mystical Torch, Charlie Finn unveils the faith and vision of John Yungblut. 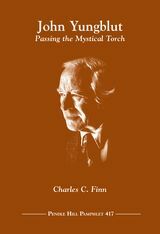 At the heart of this story, readers will discover a spiritual “genealogy”: Rufus Jones, Pierre Teilhard de Chardin, and Carl Jung, who influenced John Yungblut who became a spiritual guide and friend to Charlie Finn. For John Yungblut, mysticism was the “heart and core of all true religion.” Yungblut’s gospel of evolutionary Christianity, underscoring the call for contemplatives in action, first caught Finn’s attention as he read, by chance one evening, Yungblut’s contributions to the book Speaking of Silence,a dialogue about contemplative life. Finn’s joy and enthusiasm for his subject permeates this biography. Charlie Finn joined the Society of Jesus after graduating from high school in Cincinnati, Ohio. His ten years in the Jesuits, which coincided with the upheavals of the 1960s, were transformative. He switched careers from teaching to counseling and relocated with his wife Penny from Chicago to southwest Virginia in 1979. Gardens and pets have their full attention now that their two children are making their way in the world. Charlie Finn has a counseling practice in Roanoke, specializing in addictions and life transitions. He has published twenty-one books (mostly poetry), all relating to the spiritual journey. Finn’s own journey has been rich. He left organized religion in the early ’70s and resigned himself to being a spiritual maverick. His love of reading and travel has opened him to the wealth of many paths. Finn’s hunger for a spiritual community congenial to his vision never left him, however. Following the lead of many insights and experiences deepening bond with Jesus the mystic, Jesuit focus on “contemplation in action” and “finding God in all things,” Taoist trust in way opening, Native American Earth-mysticism, Creation-centered emphasis upon ongoing creation and revelation—Charlie Finn has found a home in the Religious Society of Friends. He is a member of the Roanoke Monthly Meeting.